Do you know 35% major cause of early death for baby are caused by inadequate care of children and women, inadequate diets, over consumption of unhealthy foods? Four students from Institut Teknologi Telkom, Indonesia realized this problem and want to put a stop on this problem by using “childhood” application. They are Team Gatotkaca from Indonesia. The team is consist of Dody Qori Utama, Arganka Yahya, Kania Audrint, and Anggunmeka Luhur Prasasti. With the help from Dr.Tauhid Nur Azhar, health practitioner and doctor who later on voluntarily dedicate himself as the team mentor for this project, they have successfully enter the worldwide final of Imagine Cup. Check out their project at Imagine Cup People Choice’s Award and support them if you like their project by casting your vote on them. They will heading to New York City represent Indonesia in Imagine Cup 2011 Worldwide Final in Software Design category this coming 8th – 13th of July 2011. They will be competing with teams around the world. I’m lucky enough to get contact with them and learn about their story as one of the Microsoft Student Partner (MSP) Social Media Team. Q: Tell us about your project? 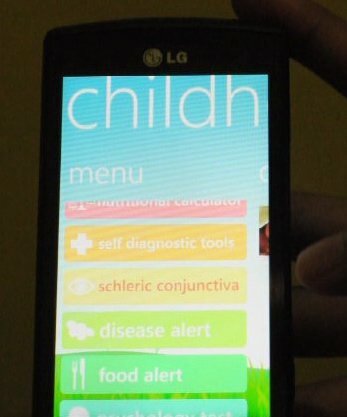 The “childhood” is a project which is built to educate mothers about healthy eating habits for children and recognize child development milestone through their own smart phone. It allows mother to be more aware about their children health and increase parent involvement which is crucial to proper child growth. “childhood” is also connected with doctors who can suggest a proper action if the system detects unusual development from child growth. The design and development of “childhood” stemmed from the fact that many parents struggle with a lack of information about healthy eating habits and the importance of breast-feeding. According to World Health Organization, 35% major cause of early death for baby are caused by inadequate care of children and women, inadequate diets ,over consumption of unhealthy foods. Through posyandu*, government actually has already set seminar and training for educating mothers to strengthen knowledge on importance of childcare. However, the quantity and quality of such activities highly depend on each posyandus , that some posyandus, actively hold such program for mothers in the neighborhood, while some others are less active or even dormant. With social and economic activities nowadays, mothers tend to skip posyandu’s program. Still these mothers actually need comprehensive guidance for nurturing their children. Therefore this “childhood” project aims at delivering a comprehensive guidance for recognizing baby development milestones, measuring child growth, and detecting whether there is unusual children development .This system is also capable of analyzing food composition that agrees with healthy eating habits for children. In terms of worldwide deployment, it is highly feasible because WHO has released standardized criteria for measuring child growth for every country. All children have every right to be raised in a caring family and to have access to quality health care, good nutrition, education, play and protection from harm, abuse and discrimination. It is basically the very right to grow up in an environment in which children are enabled to reach their full potential in life. It is the duty of parents, other caregivers and family members, communities, civil society and governments to ensure that these rights are respected, protected and fulfilled. Q: Why did you create this project? What inspired you to create this project? We create this project due to the fact that our young generation is our future. We are so worry about what happened to our young generation right now and the factor endangering their life that is malnutrition. What inspired us to build this project is the story of Thomas Alva Edison’s mother who nurtured, encouraged and fed her child as best as she could so that Edison can be one of the greatest inventor in his century. We believed that if all mothers in the world know how to nurture their children the way Nancy Elliot Edison did to his son,we are going to have wonderful and bright young generation in the future. That’s why we want to equip mothers with the very best tool to nurture their children and decrease the risk of malnutrition happened to their own children. Q: Is this your first time joining Imagine Cup? How does it feel like? 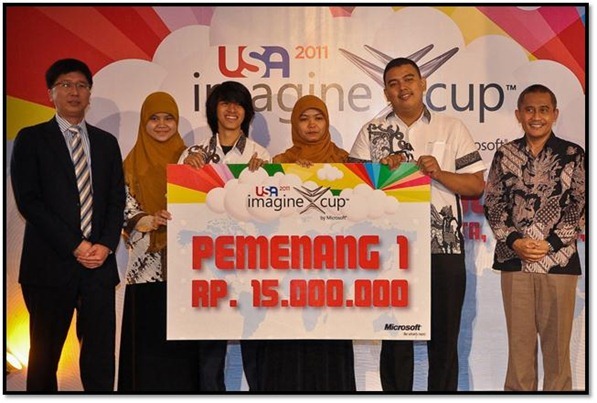 No, it is not, some of us have already participated in Imagine Cup 2010 in Poland Warsaw. This experience is such a valuable thing because we get to know people around the world with their own project and solution, learning about team works and how to present our idea to the world . Q: How has your participation in the Imagine Cup impacted your life? Our participation to this competition Imagine Cup broadening our vision and expanding the meaning of our role in this life. We are not afraid of dreaming at all. We believe that each and every single of us is playing important role to society to take an action about problem that occur around us. Q: What is your plan on your project after Imagine Cup 2011? We really want to implement this project on society and the world. We have already made a cooperation between health department (Indonesian medical association) to take this project into reality. Find out the latest update from Team Gatotkaca by liking the team on Facebook fans page or follow them through Twitter. You can also stay tune in my blog for more update on Team Gatotkaca and event of Imagine Cup 2011 Worldwide Final at New York City or follow the official Imagine Cup fans page or Twitter.